The Brush Shortcut panel will always show the currently selected brush. 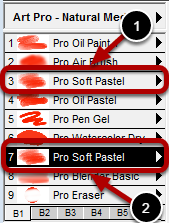 Brushes selected from an ArtSet get copied into the Brush Shortcut panel so that they can be modified without impacting the original brush stored in the ArtSet. The name of the ArtSet where the currently selected brush came from. Nine brushes are accessible from this list. This icon, when clicked, with popup the Brush Select Dialog. 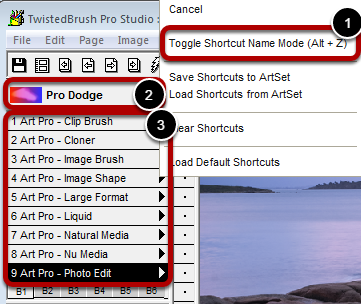 These are the Shortcut keys to quickly select a brush. 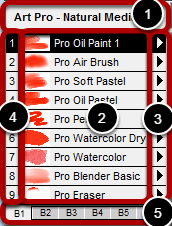 The Brush Shortcuts have 6 banks of nine brushes. Clicking the tab will switch to that bank of nine brushes. It is often very useful to make a copy of a brush in the Brush Shortcut panel. Holding the Shift key while clicking on a Brush Shortcut slot will make a copy of the currently selected brush. This brush was original selected. Shift key + click copied the brush to this brush slot. 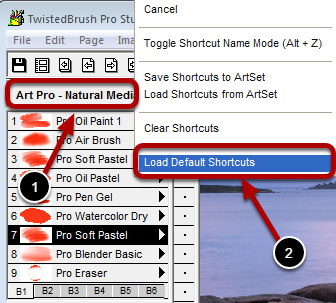 To reset the Brush Shortcuts back to the original set of brushes. Click the ArtSet name area. From the popup menu select Load Default Shortcuts. 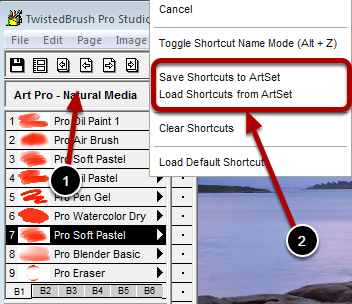 From the popup menu select Save Shortcutes to ArtSet or Load Shortcuts from ArtSet will allow you save all your Shortcuts to an ArtSet or to load the brushes from an ArtSet into the Shortcuts. There is an alternate display mode for the Brush Shortcuts panel. In this mode rather than the brush names appearing in the list it is the ArtSet name. It is a different way of working that may appeal to some. The display mode can be toggled from this popup menu choice. Rather than the ArtSet name appearing here the current brush name is shown. The ArtSet name is shown here that rather than the brush name.